It is not atypical of Sleep Apnea patients in Toronto to give up on CPAP therapy a few weeks into it due to the difficulties they face, adjusting to the device. There’s hardly a patient who hasn’t experienced a congested throat or a dry nose while using the device. Masks don’t fit well. It feels claustrophobic. The tubing gets pulled in the middle of the night adding to the long and odious list of woes that sleep apnea patients already face. Despite the challenges, the results can be life-changing and so sleep specialists recommend and encourage users to get adjusted to the machine before they start wearing it to sleep every night. Yes, it may take time, sometimes weeks before a person gets used to the mask and the device. But most common problems have easy solutions. 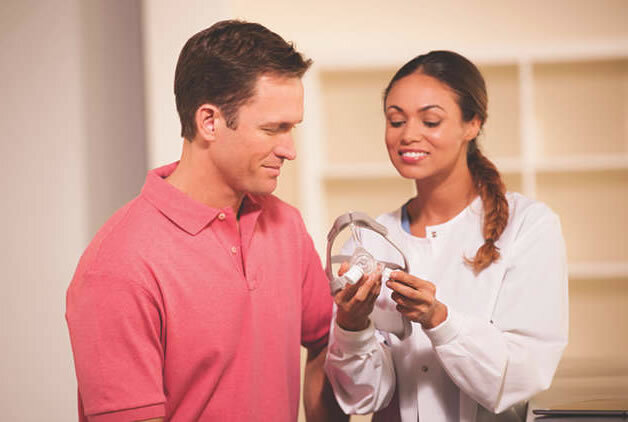 Here are a few steps that you can take to adjust to your new CPAP device. Understanding the device: CPAP technology is changing everyday and newer compact machines are being introduced. These are silent and incorporate features like APAP, RAMP and EPR which may be needed to allow you to customize it according to your breathing needs. So, speak to your sleep specialist and your DEM technician to understand the machine. What are the basic settings? How do you ensure that it does not switch off at night? Can you alter these settings without consulting your healthcare provider? Get answers to all these questions before you start to use the device. Masks: There is no ‘magic-mask’ that will fit perfectly in the first attempt. However, you have a plethora of choices. So, even if you have tried a bunch of them, feel free to ask for more options till you find one that fits perfectly. It has to fit comfortably without digging into the skin or leaving marks. The tubing should allow you to move around freely in bed. Wear the mask during the day: This is one of the easiest ways to get accustomed to the mask on your face. Wear it while you watch TV or while you are walking around the house. Start taking small naps while wearing the mask with the device switched on. If you can sleep comfortably for half an hour, start increasing it by 30 minutes until you feel confident enough to wear it all night. Learn to breathe, not swallow: Many patients experience bloating because of incorrect breathing techniques. So, while you are at the sleep centre, learn how to breathe normally while using the machine rather than swallowing air. This will help you prevent bloating. Give it time: Last but not the least, you need to have time and patience. Think of it like buying new shoes. Your feet will hurt in the beginning but once it’s worn-in, you will refuse to try anything new. It takes a week or even a couple of weeks before people start to experience the results of CPAP. So take time and be patient.